Cost: A 5 course tasting menu is offered for £39 pp (or £69 with five matched sparkling wines/Champagnes). On the à la carte menu, small plates are from £8.50 to £9.50 (although there is a blow-out dish of 30g Finnish Baerii caviar for £95). Salads are £6.50, sides including Mac & Cheese or hand cut chips are from £2.50 to £4.50. Desserts are all £6.50. About: Tirage is a new restaurant and Champagne bar that opened in early 2014. Just a stone's throw from Liverpool Street Station and the Heron Tower with its Sushi Samba and Duck & Waffle restaurants, it joins a number of local eateries that are bringing a real foodie vibe to this otherwise rather corporate area of the City. Venezuelan Elio Machillanda, a former City worker, has put his life and soul into this new venture in collaboration with Michelin-starred restaurateur David Moore (of Pied à Terre, L'Autre Pied and pop-up Pied Nus reviewed here), the concept of the restaurant being to partner good quality small eats with Champagnes and sparkling wines by the glass. Sommelier Roberto Della Pietra, formerly of Gaultier Soho, spent 6 months prior to the launch of the restaurant researching and planning a Champagne list that would complement a range of aperitif, fish and meat dishes by Head Chef Alasdair Fraser, and developing set menus partnering small eats and Champagne. And his work has paid off – the list includes a range of Champagnes and sparkling wines, twenty of which are available by the glass including some gems I have never encountered before such as a rare Russian sparkly. But more of that later. I had the pleasure of spending a few days with Roberto on a wine press trip to Somontano in Spain last year (reviewed here), and was impressed by his knowledge of the wines of that region, and by his acute but uncomplicated approach to wine. The house champagne is supplied by Perrier Jouët, which also has an eponymous dining room for up to 12 guests suitable for business or private functions. The first floor has a private bar and dedicated kitchen catering for up to 100 guests. The head chef is Alasdair Fraser (formerly of Kensington's The Abingdon), who has created a French menu with Peruvian touches for Tirage. What We Ate/Drank: We went for the 5 course tasting menu with a matching flight of Champagnes and sparkling wines. 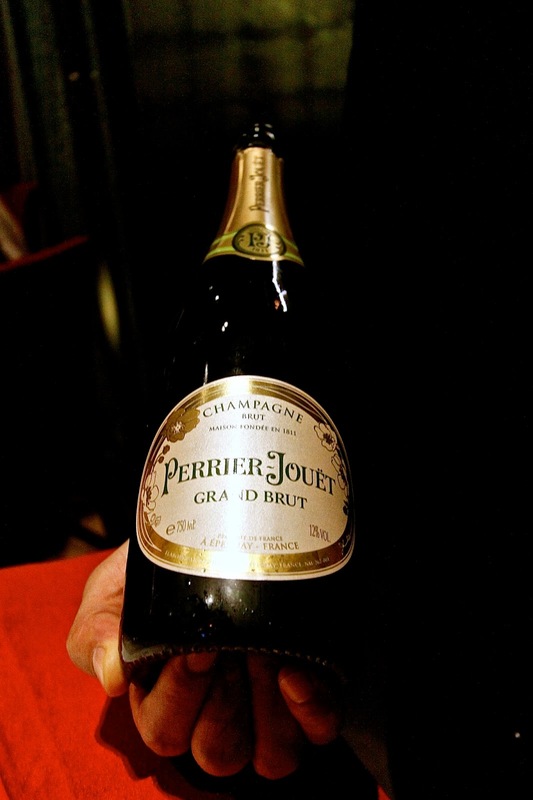 We started with a glass of house Champagne from Perrier Jouët, which was elegantly refreshing. The menu kicked off with 3 of the freshest rock oysters from Colchester, simply served with a thick wedge of lemon and a red wine vinegar and shallot dressing. 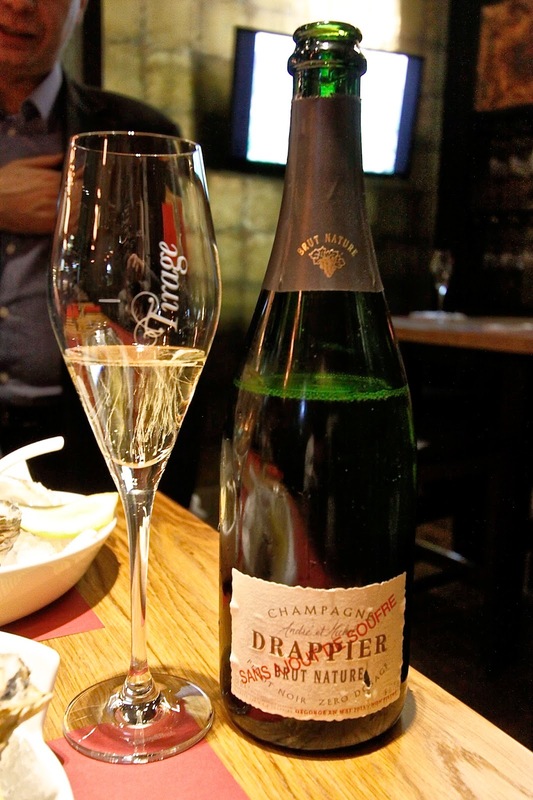 With the oysters came a glass of Drappier "Sans Ajout de Soufre" zero dosage Champagne. Having no added sugar, this had a bracing minerality, well balancing the ocean flavours of the shellfish. Next was a Cornish scallop ceviche, with caramelised Jerusalem artichoke purée, prosciutto powder, kaffir lime, pomegranate and sorrel flower reduction. This was a gorgeous dish both in the presentation and the palate, with freshness and a thrilling combination of flavours and textures. 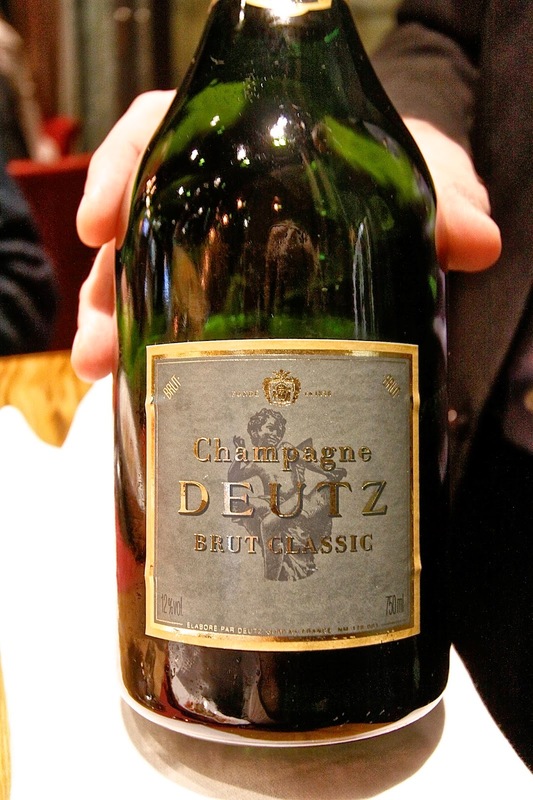 To accompany the ceviche, the sommelier's choice was a Duetz Champagne Brut Classic. Owned by Louis Roederer, it had a fine toasty nose and elegant structure, which has prompted the likes of Serena Sutcliffe, Master of Wine, to call it "the Champagne for people in the know". To follow, there was a pan-fried seabass, with an Asian-scented seed crust, white crab emulsion, broccoli and curry oil. I loved this dish, and the seabass, having been cured, roasted and then pan fried was tender, well flavoured and perfectly cooked. The Devon crab had been emulsified with spices, and was richly flavoured. Roberto has chosen a rare Russian sparkling wine for this dish, and it had plenty of richness and spice to stand up to the fish. 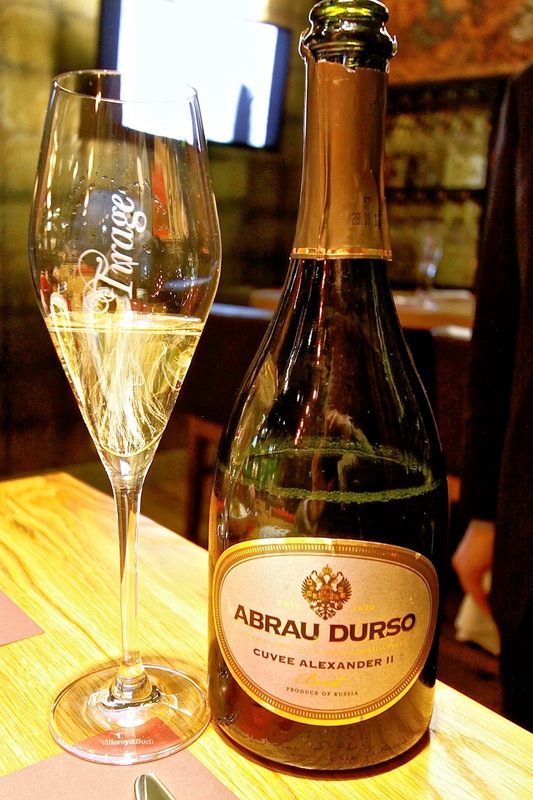 The most unusual (but also one of the most delicious) sparkling wines of the evening, and the only one that was not a Champagne, this was the Abrau-Durso "Cuvée Alexander II" NV from the Krasnodar region of Russia. Made from a blend of riesling, pinot noir, pinot blanc and chardonnay grapes, this had a magnificent spicy, clove nose and had green apple, lime and mint on the palate, easily withstanding the Asian spice in the fish dish. A revelation! Our fourth dish was pan-fried, “ethically produced” foie gras. Served with caramelised pear, chilli popcorn and blinis, it was delicious. Whereas geese have to be force-fed to produce foie gras, the ducks used to produce “ethical” foie gras are naturally greedy and will eat more than their fair share particularly just prior to (planned) migration. This fattens their livers naturally, and the resulting dish was as creamy as any I have tried, with the crunchy chilli popcorn giving a contrasting texture. 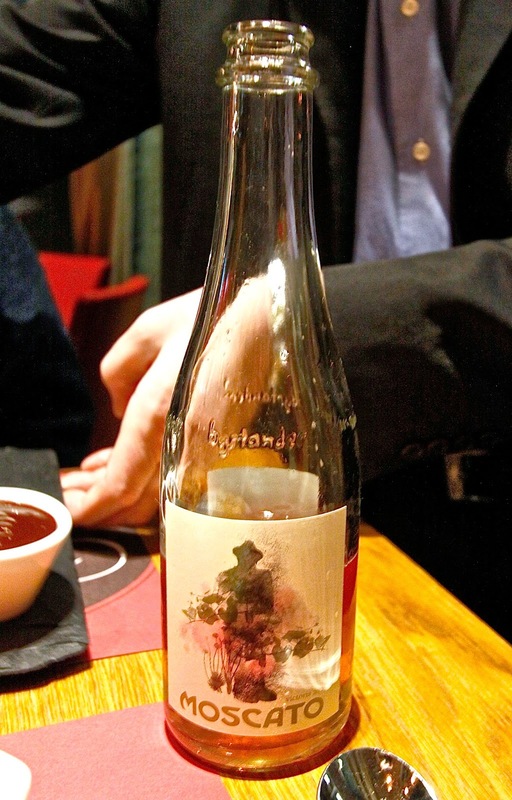 With it, we had the Champagne Michel Furdyna NV Rose, from Celles sur Ource. Made from 100% pinot noir, this was a well-structured, muscular wine with enough weight of fruit to hold its own against the unctuous liver. The final dish on the tasting menu was a venison haunch confit. Served with an acorn squash purée, chimichurri sauce and barbecued cauliflower, this was excellent with perfectly tender venison. I did not see how a Champagne could stand up to this richest of gamey meats, but once again the sommelier confounded expectations and came up with a magnificent example, with a depth of structure that only became apparent after eating the meat. This was a truly splendid glass of Coulon Premier Cru NV. 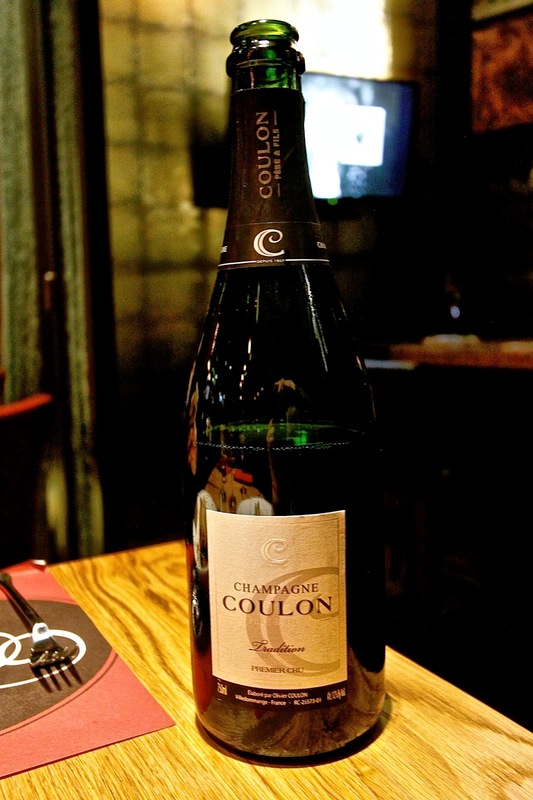 Roger Coulon is unusual in planting pinot meunier on as much as 40% of his vineyards, but this Champagne demonstrates the advantage of the grape in giving a tremendous depth of structure. With a fine nose of brioche, at the first brush with the palate it concealed its power beneath a surface elegance. However, when tasted with the venison, it revealed remarkably complex layers of luscious green fruit flavour, lemony acidity and minerality. Note that desserts are not part of the set menu, and we ordered them separately. We had a flourless chocolate and blueberry gateau and chocolate sauce, and also a pink Champagne and mango cheesecake with peach and Champagne sauce. Both were delectable, and well complemented by a glass of fruity, moderately sweet Italian Moscato. Likes: The small-eats style of restaurant, which allows sampling of a wide range of textures and flavours, and an extensive and really interesting Champagne menu, at a surprisingly reasonable price for its easily accessible location. A tasting menu of this quality in the City with five Champagnes or sparkling wines at £69 per person is, I think, amazingly good value. Verdict: A truly innovative partnering of modern French-Peruvian cuisine with an outstanding list of Champagnes and sparkling wines. Tirage's tasting menu partnering food with Champagnes is magnificent, and one of the best value in the City. Highly recommended. Getting Hot Under the Collar at Er Mei!